The following months showed me, the beauty of the hybrid vinca. The plants, although small, not even a foot (30 centimeters) higher, had an awesome blossom, all during this period of three months. The dark coloured shiny and velvety leaves and the vivid coloured dark flowers presented an absolute contrasting image of the plant, to an extent, that my neighbours used to praise it. 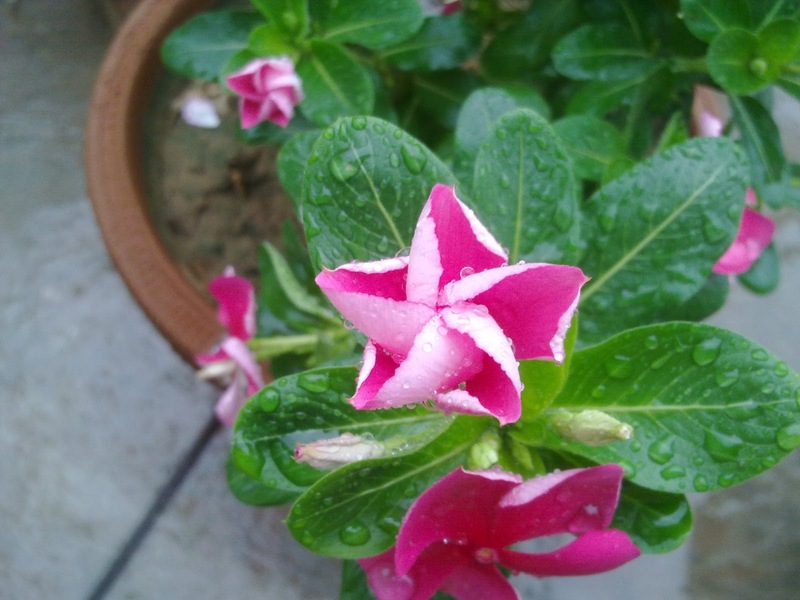 The following month was very crucial to these vinca plants because the monsoon season had set in fully, and it was the time during mid august, that, the plant started giving numerous starshaped flowers, particularly, clicking picture of these early in the morning was awesome. The half bloomed buds, had a beauty of their own. The vinca, during the peak of the monsoon season. 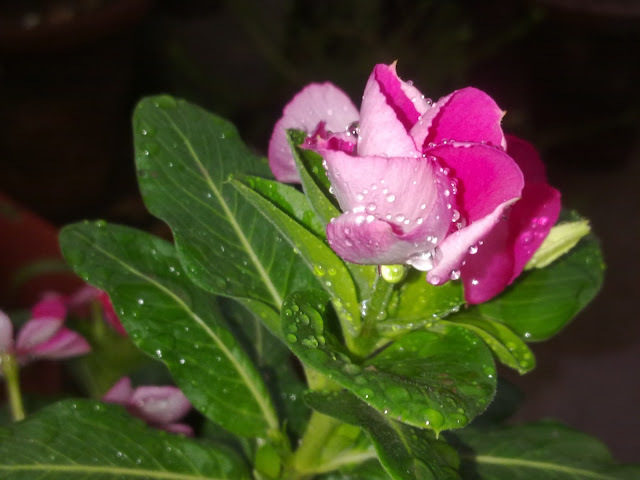 The vinca, during the peak of the monsoon season. This photograph was clicked with a cell phone camera, as were the others, that too in overcast conditions, so, a bit low in brightness. Most of the times, the sky used to be covered with a thick cover of cloud, more so during the early morning hours and late evening hours. Most of these vinca images were clicked during these times only as during I used to cater to my professional life. Since, I do not like editing my images much, and more so, I do that very rarely, so, here they are unedited, untouched. The stars, with tiny droplets of rain water. 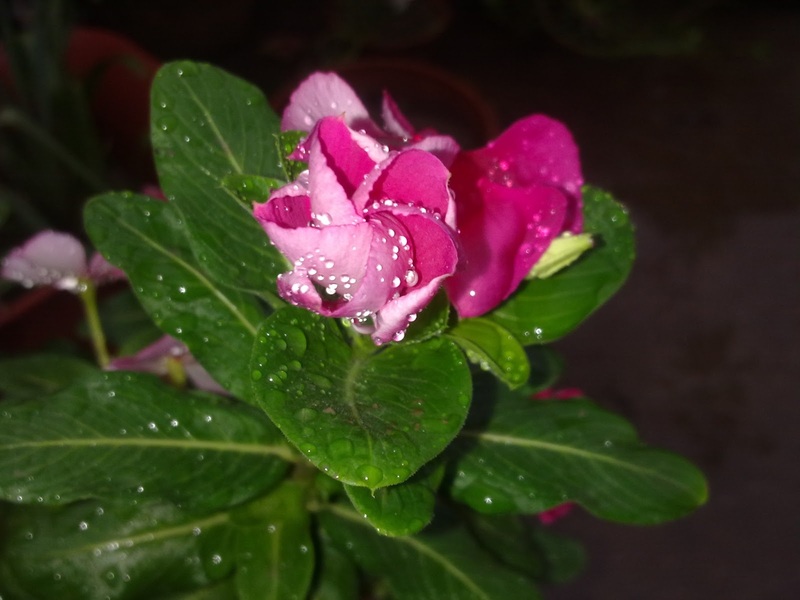 This photograph was clicked during early hours of morning, at around 6.00 am , while the vincas are still preparing to open up their petals, to show their beauty to the humans as well as the insects, bees and the butterflies. And the star of the day. 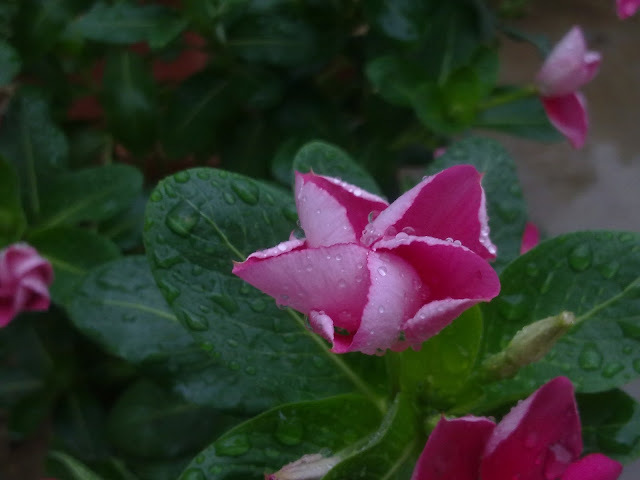 One of my best clicked images from the vincas, using the rather weak LED flash with which my Nokia is equipped. The end of this flowery tale of the vincas was rather sad. Since these were hybrids, none of the two plants bore any fruits and seeds, as opposite to the regular pink vinca, which bears the fruits and if left uncollected, the following season, you may end up with many of those vincas.